On October 17, 2017, there was an ammonia release at the Fernie Memorial Arena which tragically resulted in three fatalities, as well as the evacuation of 95 residents from 55 nearby homes. 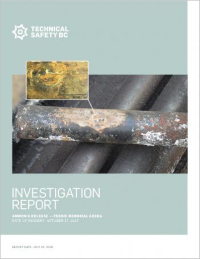 On July 25 Technical Safety BC held a press conference and released its Investigation Report into the ammonia release. The report provides an overview of the incident, the scope of the investigation, and key findings regarding contributing factors. Technical Safety BC also made 18 recommendations to further improve safety in ice rink refrigeration systems, and discussed a number of regulatory actions taken in recent months to prevent similar incidents. A - Engineering Analysis - Cold Dynamics Ltd.